Use of sensors is pretty common in industries and organizations. But, Internet of Things (IoT) has put the usage of sensors at a completely different level. Again, the entire concept of IoT exists and survived because of sensors. What role does sensors play in IoT? Simply answered, they are the medium through which various physical objects are connected through Internet. IoT platforms function and deliver various kinds of intelligence and data using a variety of sensors. The world has gone digital and “smarter” through the interconnection of things via Internet through sensors. The paradigm of connected things has made sure that individuals, businesses, and industries are able to work intelligently with an enormous amount of data being collected and implemented by the IoT sensors.This story features on the prominent types of sensors in use in the world of IoT. v And then delve in to the main topic, that is, the types of sensors used in IoT. A detailed discussion follows hereafter. Just as our five sense organs—sense of sight, of hearing, of touch, of smell, and of taste—allow us to perceive the world, sensors are devices that allow machines and humans operating the machines to make sense of the world.Simply explained, a sensor is a device that detects and responds to some type of input from the physical environment. The specific input could be light, heat, motion, moisture, pressure, or any one of a great number of other environmental phenomena. The output is generally a signal that is converted to human-readable display at the sensor location or transmitted electronically over a network for reading or further processing. The BMP280/BME280 sensor, an I2C sensor, is used to measure barometric (also known as atmospheric) pressure. An oxygen sensor in a car's emission control system detects the gasoline–oxygen ratio, usually through a chemical reaction that generates a voltage. A computer in the engine reads the voltage and, if the mixture is not optimal, readjusts the balance. The MQ-4 sensor has a high sensitivity to natural gas. Internet is basically a communication system, and that too a cost-effective one. More technically explained, internet is a globally connected network system that uses TCP/IP to transmit data via various types of media.Internet of Things (IoT) is a network of devices that are connected via Internet, which facilitates interchange and exchange of data. Attaching sensors to things and interconnecting them via Internet allows organizations to track real-time locations, monitor performance, improve workflows, and optimize utilization. Examples: A “smart” boating solution enables boat owners to check in on their boat(s) from afar and make sure all systems are functioning correctly.And, a car tracking solution allows personnel at the auction locations to quickly locate the vehicle(s) they’re looking for, rather than manually search through thousands of parked cars. Smart irrigation systems serves as one of the numerous best examples of use of sensors and IoT. Sensors sense soil moisture and helps decide whether to water soil or not. If the irrigation system receives information about the weather from its internet connection, it can also know when it’s going to rain and decide not to water the crops today because they’ll be watered by the rain anyways. Commonly used in devices like A/C control and refrigerators, IoT has extended their use to manufacturing processes, agriculture, and health industry. The types of temperature sensors are thermocouples, resistor temperature detectors, thermistors, IC (semiconductors), and infrared sensors. For example: Temperature and humidity data can be read from DHT11 sensor and this data can be uploaded to a ThinkSpeak cloud using Arduino Uno and ESP8266 module.Melexis MLX90614, Environdata TA40 Series, Geokon 4700 are the top picks for temperature sensors in industrial IoT applications. Proximity sensors are best to detect motion. These sensors find their use in retail industry to detect special offers of nearby products, to check parking availability in parking lots, and so on. The types of proximity sensors are inductive sensors, capacitive sensors, photoelectric sensors, and ultrasonic sensors. For example: Waste bin sensors, like MB7138 XL-Trash Sonar-WRM, are the most effective to know exactly what is happening inside a waste container. A pressure sensor is a device that senses pressure and converts it into an electric signal. For example: KELLER pressure sensors detect flood water levels or changes in load distribution in bridges, thereby alerting emergency services when flooding is imminent or when a bridge’s structural health is compromised.Pressure Systems Series 960, 970, Paroscientific Inc. Series 1000, 2000, 6000, Environdata BP10 Series are some of the most commonly used pressure sensors in industrial IoT applications. Such sensors are used to detect the water quality and Ion monitoring primarily in water distribution system. They find use in a variety of industries. For example: The oxygen-reduction potential sensor provides insights into the level of oxidation/reduction reactions occurring in the solution. They are extensively used in industrial environmental monitoring and process control, intentionally or accidentally released harmful chemical detection, explosive and radioactive detection, recycling processes on Space Station, pharma industries and laboratory, and so on. Gas sensors finds there use in industries for purposes like detection of hazardous gases, chemical industry research, manufacturing industry, and so on. Carbon dioxide sensor, breathalyzer, hydrogen sensor, ozone monitor, electrochemical gas sensor, gas detector, hygrometer, air pollution sensors are some gas sensors commonly used. Optical smoke sensor (Photoelectric): Optical smoke sensor used the light scatter principle trigger to occupants.Vishay’s VCNL4020X01 and TCxT1600X01 are optical sensors designed specifically for the industrial IoT applications. Ionization smoke sensor: Ionization smoke sensor works on the principle of ionization, kind of chemistry to detect molecules causing a trigger alarm. An infrared sensor is a sensor which is used to sense certain characteristics of its surroundings by either emitting or detecting infrared radiation. It is also capable of measuring the heat being emitted by the objects.Asahi Kasei Microdevices (AKM), Murata, Melexis MLX90614, Intersil ISL29021 are among the few IOT IR sensors used in industries. They are now used in a variety of IoT projects, especially in Healthcare as they make monitoring of blood flow and blood pressure simple. They are even used in a wide array of regular smart devices such as smartwatches and smartphones as well. Other common use includes home appliances & remote control, breath analysis, infrared vision (i.e., visualize heat leaks in electronics, monitor blood flow, art historians to see under layers of paint), wearable electronics, optical communication, non-contact based temperature measurements, automotive blind-angle detection. Therefore, sensors can collect critical information about the environment, allowing for early detection of environmental disasters like earthquakes, tsunamis, etc., thus saving lives. Again, better surveillance and tracking tools allow authorities to detect when crime has occurred and respond much faster, keeping citizens safer. In today’s “smart” world, sensors play an important role in our everyday life and in IoT.Sensors monitor our health status (e.g., a heartbeat), air quality, home security, and are widely used in the Industrial Internet of Things (IIoT) to monitor production processes.Sensors can collect critical information about the environment, allowing for early detection of environmental disasters like earthquakes, tsunamis, etc., thus saving lives.IoT enables heightened surveillance, monitoring, and detection, which all combine to improve health and increase safety.This is particularly interesting for organizations like local or city governments, which need to ensure the health and safety of their residents, but also extends to large businesses supporting their employees. Rather than just passively providing information and reacting to our inputs, much of the value of IoT will come from anticipating and addressing needs automatically. Balearic Islands became a “smart” tourist destination by expanding IoT sensor networks. Libelium’s technology installed in Palma de Mallorca harbor revealed that ferries cause more air pollution rather than cruises. The environmental report of ESPO (The European Sea Ports Organisation) for 2018 shows that air quality remains the main priority of European ports. 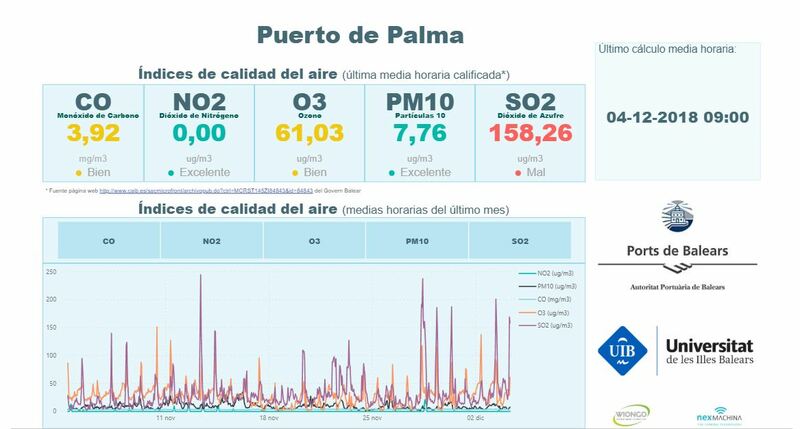 Aware of this, thePort Authority of the Balearic Islandshas been working hard since 2016 to also know the level of air quality, capacity, and alignment with the Environmental Policy of the Port Authority of the Balearic Islands.In 2017, the Balearic Harbors Authority (APB in Spanish),Mallorcawifi.com, in collaboration with theUniversity of the Balearic Islands(UIB in Spanish), implemented an IoT project based onLibelium sensor platform to control the environmental impact of the vessels in the Port of Mallorca. Authorities were worried about the high level of cruises, ferries, and boats, in order to prevent theirnegative effects on life conditions in the surrounding areasin such a touristic destination.Almost two years data gathering after the installation of the nodes, the Balearic Harbors Authority has reached the first conclusions from the data captured by the network of nodes. In July 2018, it was brought to light by researchers at the UIB that cruises were not the first cause of pollution in the area, but passengers’ and commercial ferries. The measuring stations control levels of carbon monoxide (CO), Particle Matter(PM), ozone (O3), carbon dioxide (CO2), sulfur dioxide, and noise every ten minutes. The authorities confirm that higher levels are reached in the morning, between 6:00 and 11:00 AM. After the results of the study were published, the authorities of the port showed its interest to implement new policies in order to diminish the pollution and its negative impacts. In the future, the port will offer free power to vessels, which will be asked to switch off their motors while berthing to diminish emissions. The above example of the Balearic Islands is just one of the numerous real-world applications of IoT through use of sensors.